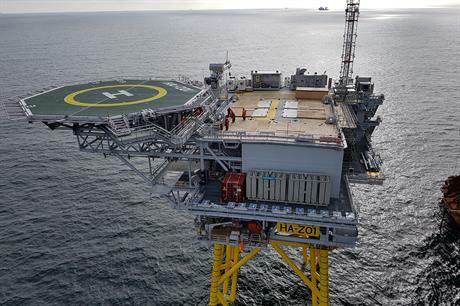 UK: Developer Ørsted has installed a reactive compensation station (RCS) along the export cable route for its 1.2GW Hornsea Project One site -- a world first, the developer claimed. The RCS helps transmit the high-voltage alternative current exported from the project with fewer losses over the long distance. Hornsea Project One is located 120km from the UK's east coast, with the RCS located approximately half way along the cable route. Ørsted claims it is the first time an RCS has been installed offshore anywhere, though they have been used in onshore settings. It was installed on a jacket foundation and weights roughly 4,000 tonnes. Currently under construction, Hornsea Project One is set to become the largest offshore wind project in the world, and one of the furthest from shore. Due online in 2020, the project will be powered by 174 Siemens Gamesa SWT-7.0-154 turbines. Offshore construction activity commenced in January.